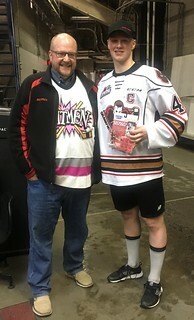 After our final playoff game of the 2016-17 season, I was lucky enough to go backstage with Carl & Carla who billeted Micheal Zipp, Captain of the Calgary Hitmen. Carl & Carla mentioned to me that Micheal really liked the action figures I made for Radel Fazleev a few years ago, and he hoped that he would get one someday. Well, this year Micheal scored the Teddy Bear Toss goal, and was also our Captain this year. So, for those achievements, I made him an action figure. All the best in your future endeavors Micheal! I know you'll be awesome at whatever you pursue on your next adventure!